I went to law school with a particular passion in mind: the First Amendment and freedom of speech. Starting at Stanford in 1997, I took virtually every class the law school offered on the First Amendment, completed six additional credits on the origins of the legal theory of “prior restraint” in Tudor England, and worked for the ACLU of Northern California. I was nonetheless unprepared for the kind of censorship I would see on college campuses, first as legal director and then as president of The Foundation for Individual Rights in Education(FIRE). My recent book, Unlearning Liberty: Campus Censorship and the End of American Debate, is my attempt to catalog a small fraction of the terrible cases I’ve seen over the last 11 years and to explain why college censorship matters both on and off campus. I open Unlearning Liberty talking about the currently ongoing legal saga that straddles the chasm between absurd and serious. The case involved a student, Hayden Barnes, who protested against his school, Valdosta State University in southern Georgia, for its decision to build two parking garages on campus. He went about protesting the parking garages by contacting the Board of Regents and writing a letter to the editor of the student newspaper. By all accounts, Barnes’ protests were civil and respectful, but he nonetheless gained the ire of the university president, Ronald Zaccari. The president started holding meetings with his staff to see if he could punish or expel the student, and in the process of looking for a reason discovered this Facebook collage (the image is faithful recreation of the original, somewhat battered collage) Barnes had used to the protest the garage. Because Barnes had titled the collage the “S.A.V.E. 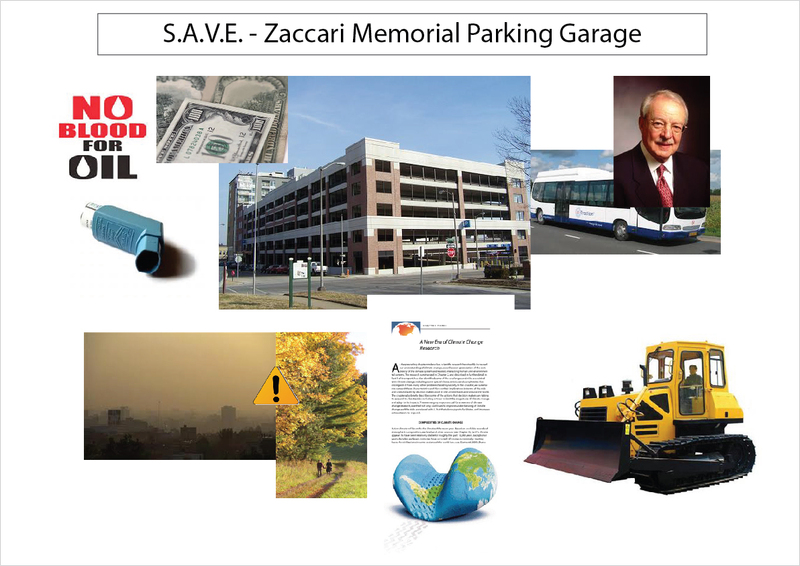 - Zaccari Memorial Parking Garage” (“S.A.V.E” referring to an environmentalist group on campus that Barnes believed had fallen down on the job) President Zaccari claimed that this was a death threat. Zaccari moved unilaterally to expel Barnes, claiming he was a “clear and present danger” to campus. Barnes then contacted FIRE and has been litigating the case since 2008 with the help of renowned First Amendment lawyer Robert Corn-Revere. The facts of the case were considered so bad that now former President Zaccari is being held personally liable for violating the student’s due process rights. Legally speaking, probably the oddest thing I run into on campus is the pervasiveness and tenacity of campus speech codes. There is a popular misconception, sometimes even repeated in books about free speech on campus, that speech codes came into existence in the 1980s and 90s but then disappeared after roundly being defeated in the courts of law and in the court of public opinion. This “fact” is simply untrue. FIRE’s latest survey of over 400 campuses found that 63 percent of top colleges maintain codes that violate First Amendment standards. Some of these codes involve speech regulations that were specifically found unconstitutional during the supposed heyday of political correctness. FIRE’s speech code of the month for September 2006 at Drexel University in Philadelphia, for example, included a provision that banned as harassment “inappropriately directed laughter,” wildly overbroad language that had been squarely defeated at the University of Connecticut back in the 1990s. The survival of speech codes is odd because every time a speech code has been challenged (approximately 17 different cases as of this writing) on a public university campus, it has been ruled unconstitutional or withdrawn. Most recently, a community college in Ohio decided to back down from its blanket ban on protest signs on campus, while, this past summer, the University of Cincinnati was informed by a judge in Ohio that its absurdly small free speech zone, which constituted only .1 percent of the campus and still required 10 days advance notice in order to use, was unconstitutional. Constitutional lawyers will, of course, note that while the First Amendment binds public colleges it does not apply its protections to students at private colleges. While California applies First Amendment principles to private nonsectarian colleges through its “Leonard law,” private colleges are under no legal obligation to provide freedom of speech to their students. However, the vast majority of private colleges recognize that it is both essential to their function and in their self-interest to promise freedom of speech in glowing language to both students and faculty, and colleges should be held to those promises (I expand on free speech and private colleges at length in this column for Real Clear Religion). I am often asked why, if these violations have become so routine, isn’t there a greater outcry against campus censorship. There are a variety of reasons for this but first and foremost is the fact that the media tends to treat speech codes and violations of free speech on campus as either not a big deal or as sort of a “conservative niche issue.” Of course, this is frustrating as one can see by reading my book that the cases of censorship affects students and professors across the political spectrum and sometimes can have very serious consequences. On campus, however, there is a lack of awareness of this issue due in part to ongoing academic ambivalence to the First Amendment. This ambivalence was on full display this fall when numerous academics, including legal scholar Eric Posner, called for a re-evaluation of the First Amendment in light of the mistaken belief at the time that the Benghazi attacks were caused by the innocence of Muslims video. Meanwhile, I believe students who have grown up in a K-12 environment that places strong restrictions on freedom of speech are simply accustomed to being told what they can say and where and when they can say it. They have been habituated to a level of regulation of their lives that a previous generation would have forcefully rejected. But another reason why I think that the current generation of students do not see speech codes, speech zones, or punishments for exercising basic free speech rights as such a big deal, is because most of them have internalized some simple and easy rules: talk to the people with whom you agree, don’t bother disagreeing with professors, and either keep your mouth shut regarding hot button political issues or join more ideologically uniform groups. This phenomenon is clearly demonstrated by a study in Dianna Muntz’s excellent book, Hearing the Other Side,which shows that there is an inverse relationship between how much education someone has and how many people they talk to that they disagree with: those with the most education have the fewest disagreements with one another, and those with the least formal education have the greatest exposure to contrary points of view. The problem with this is that education could then be contributing to narrowing our point of view rather than expanding it. The fact that we live in a society that increasingly retreats to not only cyber realms of the like-mindedness, but also to neighborhoods and counties that are increasingly politically homogeneous as well is clearly outlined in several excellent books including Bill Bishop’s, The Big Sort. Higher education is uniquely equipped to help a generation poke their heads outside of their echo chambers, but it simply cannot work in an environment where it is so easy to get in trouble for simply saying the wrong thing.